Which is the Best Portable Air Compressor for You? Portable air compressors provide you with the freedom to use your powerful air tools wherever your projects lead you. They’re ideal for working on DIY projects you can’t fit in your workshop, or for tackling construction projects around a job site when electric tools just won’t cut it. With so many different portable air compressor models on the market, though, it’s hard for most buyers to tell which ones are actually worth the money. Plus, with buyers using these machines for a whole range of projects, you’ll need to figure out which ones can actually power your projects the way you need them to! We’ve done extensive research to help you out! Our team searched out the best portable air compressors on the market, comparing dozens of models until we narrowed the field down to our favorites. In this special guide, we’ll look at three of our all-time favorite models. We think there’s something for everyone here, whether you’re a home DIY enthusiast looking for a versatile, portable machine, or a working professional who needs heavy-duty power on the go. This Bostitch is our favorite pancake compressor on the market right now. Pancake compressors are great because they give you a lot of power in a very stable little package. Their fat, low stance makes them a great choice for people who are moving around with tools. This model is a very compact, portable unit with a durable build and excellent function for lighter DIY jobs. We’d recommend it to anyone who’s looking to upgrade to air tools for the first time, or for budget DIYers who don’t use any particularly industrial tools. It’s light. The Bostitch weighs just 29 pounds, so it’s extremely easy to bring around wherever you need it. There’s a handle built into the top, so you can grab and go. Previous buyers said they loved how portable the Bostitch was. They said it was light enough to carry around easily, and small enough to throw in a car or smaller pickup truck with no issues. The power cord wraps easily around the body for storage and transport. It’s very stable. The pancake format keeps the machine steady on work surfaces, with a wide and low center of gravity. There are also rubber feet on the legs, which help this one get some extra traction. It doesn’t tip over easily, which is impressive for something this light. That’s important for working on uneven surfaces, and let’s be honest–most of us buy portable models because we’re not working in a nicely finished workshop. It’s quiet, at least relative to other compact pancake models. This one runs at 78.5 decibels, which is comfortably under the danger threshold of 80 decibels for ear damage. We’d still recommend wearing ear protection, but this is one of the quieter pancake options out there at the moment. Many competing models have decibel ratings in the 80s–twice as loud as the Bostitch. Reviewers noticed the difference–especially compared to older pancake models they’d owned previously. It’s narrower than competitors. Pancake models can be awkwardly wide, but the Bostich keeps things to a trim 17”. This one is an excellent choice for DIYers who don’t have as much workspace as they’d like in the garage or basement shop. It’s easy to pack away after you’re done using it. The narrow width also makes it much less awkward to carry beside you. It’s very low-maintenance. This unit has an oil-free pump which doesn’t need to be topped off or lubricated regularly. It also has a very simple break-in process, especially compared to some other models. It uses its tank size efficiently. The 6 gallon tank stores air at 150 PSI, which is much better than comparable pancake units which work at 130 or 140 PSI. Previous buyers said it fills up pretty quickly, reaching full pressure in about 3 minutes. They also found that using lighter tools, they could easily fill up the tank, unplug the machine, and carry it to a worksite to use it where power wasn’t readily available. It packs a fair bit of power into its small size. The Bostitch puts out 2.6 CFM for standard 90 PSI tools. It’s ideal for brad nailers, framing nailers, staple guns, and other light-duty DIY tools. Thanks to the fast refill time, it’s a good choice for two users to work from in tandem. Previous buyers said this one did a much better job keeping up with two nailers than other pancakes they had tried. It’s built for teamwork. There are two output nozzles already built in, so you won’t need to add an additional coupler or adaptor to work in tandem from the Bostitch. We especially like that the output nozzles are lined up with the standpipe, which means that you won’t twist or tangle air hoses as you work. Previous buyers said it was ideal for two people to use roofing nailers at the same time. It’s rated to work well on extension cords and in cold conditions, thanks to the “quick-start” motor function. We couldn’t find any complaints about the motor starting. It’s made in the USA, and previous buyers were quick to note how obvious the difference in build quality was between the Bostitch and imported pancakes from other brands. It’s covered by a 1-year warranty, and has a great record for reliability. While this one comes with a decent 25-foot hose, most previous buyers found that the included hose was too short to work practically without constantly moving the compressor unit around. We recommend upgrading to a 50-foot, non-PVC hose if you are able. This is a good unit for nailing and other lighter carpentry work. However, we wouldn’t recommend it for rapid-fire nailing, or for larger tools like sanders or blasters. While the Bostitch is built very nicely, it’s not professional grade. This is a small unit we’d recommend for DIYers and home mechanics, not for people who will use it every day on jobsites. Some buyers noted that the air regulator dial wasn’t as precise as they’d hoped. They said that they sometimes had to fiddle with it to get the exact pressure they needed. However, most users didn’t report any problems. This Rolair is our all-time favorite small compressor. It’s much quieter than the Bostitch, and it’s nearly as powerful without making nearly as much noise. It’s an excellent choice for small woodworking shops, and home DIY workspaces where it’s important to keep noise to a minimum. While this might not be the most powerful or high-capacity model on the market, it’s well-designed, well-made, and a pleasure to use. If you’re looking for the best portable option for lighter DIY jobs, tire fill ups, and air-powered cleaning, this hot dog compressor is an excellent machine which previous buyers ended up loving. It’s very quiet. This one runs at just 60 decibels–almost 20 decibels less than the Bostitch, which works out to a nearly 75% noise reduction! It’s the quietest oil-less model we’ve found on the market, and that noise reduction makes a big difference in how you’ll use the machine. That’s thanks to a special muffler system, as well as insulating rubber feet to keep vibration and rattling from causing a racket. You won’t need ear protection with this model, and you don’t have to shout to be heard over it. The superbly quiet noise level makes the Rolair an ideal tool for smaller woodworking shops in basements or garages where noise echoes, and where other people are close by. Previous buyers said they were thrilled to be able to speak at normal levels over the Rolair. Reviewers also loved not having to worry about disturbing family members or neighbors while they worked. If you’re a night owl or early morning worker, this is the perfect compressor for you. It’s deceptively powerful. The Rolair is rated to 2.35 CFM, thanks to a 1 HP/1725 RPM motor. While this model has a lower CFM rating than the Bostitch, it’s still more than capable of handling light DIY projects and home woodworking shops. This one’s rated to handle one larger roofing gun, or up to three smaller, finishing-grade guns at the same time. Previous buyers were surprised at how well such a small compressor could keep up with their tools. They said that between the small body and the low noise levels, they hardly noticed it working at all. It’s even more compact than the Bostitch. The Rolair is less than 17” across, and it has a nice cubic frame which is easy to fit under a workbench or on a shelf. Plus, the box-shape makes it a cinch to transport in vehicles. It’s also easier to carry by hand, since it’s much narrower than a pancake-style compressor. It’s rugged. The Rolair’s tank and frame are made from cast aluminum, which is extremely durable without all the weight of traditional cast iron. It has roll-bars all around the frame, too. They make it easy to carry the compressor, and they protect all the key components when you’re transporting the unit or using it in a busy workshop. There’s also a rubber handle grip on the central roll bar on the top of the compressor, and rubber feel on the bottom to help it stay in place and get traction on your work surfaces. 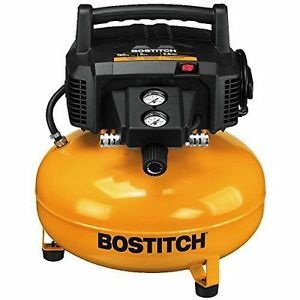 Like the Bostitch, it’s an oil-less compressor. That means it’s extremely low-maintenance, and doesn’t include any upkeep costs for you. However, unlike most oil-less compressors, the Rolair manages to be even quieter than most oil-lubricated options! There are lots of little design touches which make this a more reliable and convenient workshop companion than other small portable units. It has a higher draw than average, at 8 amps. That helps the machine start up in colder temperatures, and it makes for faster restarts each time the machine needs to cycle and refill its tank. There’s a solenoid valve on the regulator, which makes for faster and easier restarts than you have on the Bostitch. It also has a ball-valve for draining the tank-something you’d ordinarily find only on a premium compressor unit. It’s covered by a 1-year warranty. This one also has a superb reputation for durability and reliability. Previous buyers said that Rolair service was exceptional in the rare cases that they had questions or needed replacement parts. It’s not quite as powerful as the Bostitch. Like the Bostitch, it’s simply not big or powerful enough to handle larger tools. Previous buyers said it was surprisingly powerful for its size (and especially its volume level), but they didn’t recommend trying to use this one with anything that requires a continuous air feed, like a sander or blaster. This is for nailers, impact wrenches, and other tools with a shorter cycle. It has a smaller air tank than the Bostitch. This one has a 2.5 gallon tank, slightly less than half the size of the Bostitch. It also stores air at a lower rate: 125 PSI as opposed to 150 PSI. Since it has a smaller air capacity than the Bostitch, it will cycle more often to keep you supplied with compressed air. With that said, the cycles are so quiet that we don’t really mind. This is only a big downside if you’re trying to work at sites without local power feeds. The Bostitch has a large enough tank that you can pre-compress air and bring it to the site with a reasonable working time before the tank runs out. That’s not the case with the Rolair. You’ll need to have a power source wherever you’re working. It’s heavier than the Bostitch. The Rolair weighs 39 pounds, mostly due to the rugged roll-bar frame around the outside of the compressor. When you’re looking for portable air power, and lots of it, you can’t do any better than the NorthStar! This high-powered, high-capacity gas unit provides the oomph of a stationary compressor with the flexibility of a portable unit. Thanks to the gasoline motor, you can run it absolutely anywhere, even at job sites where extension cords are nowhere to be found. It also provides a CFM rating and air capacity that comparable electric units can’t hope to match. This is our top recommendation for people who need to run big, powerful tools on a worksite or on the go. It can handle absolutely any implements, and it’s rugged enough to serve the most demanding builders or work crews for years. It’s gas powered. That means you don’t need to have any sort of electrical supply. It’s ideal for running air tools from a work truck or van, or for supplying work sites where there’s no electrical feed powerful enough to supply your tools. We like gas-powered compressors for work sites for two reasons. First, if you don’t have an easy access point for electricity, electric compressors are simply impractical. They aren’t always safe to run on generators, and most generators can’t give them enough power in the first place. Once you’re running a gas generator to power an electric compressor, you may as well save yourself the time, effort, and money to just get a gas compressor. Even if you do have an extension cord or outlet handy, unless you have access to a 240V feed nearby, you’ll be limited to small 120V compressors which probably can’t power your industrial tools in the first place. Gas motors work anywhere, and they work at a level of power that most electric models can’t match when they’re run off a generator or extension cord. This is simply the most portable solution for working in places where power is scarce or a limiting factor for your work. The NorthStar ideal for construction workers, contractors, and farmers who work on projects where electricity (especially at 240V) isn’t readily available. It’s also the ultimate personal DIY tool for anyone who can install it in a vehicle or on a cart. As you might expect from the gas engine, the NorthStar is extremely powerful. This unit is powered by a Honda GX 390 OHV engine, which packs a 12 HP punch. That’s 5 times as powerful as the Rolair or Bostitch, and it’s comparable to the largest and most expensive electric stationary compressors. It’s also a 2-stage compressor, which allows for the high compression rate (175 PSI). 2-stage compressors have separate stages of compression, so air is packed in twice before it ends up in the tank. Between the horsepower and 2-stage design, the Honda engine pressurizes your tank quickly, and it has no problems keeping up with your tools. This machine is ideal for larger, industrial-sized nailers, impact wrenches, and other carpentry tools, and it can handle grinders and blasters with ease as well. It has a bigger air tank than other portable compressors. Most portable units have small tanks which empty in minutes or less. The NorthStar has a 30-gallon tank which can supply big tools, and or several smaller tools at a time with no lag. 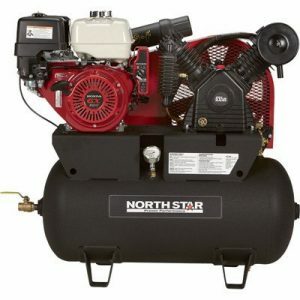 The NorthStar also uses its tank efficiently–it packs air in at up to 175 PSI! That’s one of the highest ratings on the market, and it means that this unit packs as much air into 30 gallons as many stationary models pack into 60 gallons. The high initial PSI rating means this one’s also more than equipped to power 135 PSI industrial tools. That brings us to the most impressive aspect of this model: it’s rated at a 100% duty cycle. Most other compressors are rated at 25%, which means that tools like a sander or blaster, which require a big draw in the first place, and also run at 100% duty cycle, actually need 4X their advertised CFM. The NorthStar provides a constant CFM at 24.4 PSI for standard 90 PSI tools. That’s incredibly powerful for any tool, and the fact that it can power blasters and other constant-draw tools at that rate is beyond impressive to us. In short, there’s no tool we wouldn’t recommend running off this compressor–and trust us, we can’t say that about many machines! It’s rugged. This one has Swedish valves in the compressor assembly for longer working life. It also has a steel belt guard, and bearings at either end of the crank shaft. They reduce friction, improving efficiency and reducing wear and tear on the shaft and drive components. It has a superb pressure gauge, which is filled with liquid. That insulates it from vibrations, and it prevents spikes or fluctuations in pressure. Overall, it’s one of the most accurate and reliable components on the market. The Honda engine is extremely reliable, efficient, and durable. It’s built by one of the best names in the power tool and generator industry, and it has a great reputation for quality. This one is a particularly good all-purpose engine, and you’ll see it used on anything from generators to boats and ski lift rope tows. It has an electric starter with a recoil backup, so it’s just as convenient to use as an electric system. Previous buyers didn’t report any issues with starting. While any gas-driven compressor is going to make a fair bit of noise, NorthStar has taken some key steps to help this one keep the noise down. First, it’s belt-driven, which makes this quieter than direct drive gas compressors. There are low-vibration muffling features throughout the design to minimize noise and rattling. The motor cylinders have a V-shape formation for superior cooling performance. It can be installed easily in a truck or van bed, or else be set up on any level surface. The legs have bolt-holes already drilled, and they also balance well on most ground conditions or worksite floors. It’s covered by a long warranty: 4 years for DIYers and other consumers, and 2 years for commercial operations. The Honda engine is covered for 3 years, no matter the application. It’s big. This machine is roughly 4” long, and it’s 40” tall as well. While it’s certainly portable, it’s not going to fit casually in the backseat. You’ll need a truck bed or a van to move this unit. It’s heavy. This machine weighs more than 350 pounds, so you’ll need several people to move it. We recommend it to work crews with lots of helping hands, or to people who are going to be installing it in a van or truck bed where it can stay put but still move around. It would also work with a wheeled base. There are downsides to gas power. First off, this machine can’t be run safely in indoor settings, or in the back of work vehicles without proper ventilation. Second, it requires you to haul gasoline around with you to refuel. Third, gas motors need a lot more maintenance than electric models. Finally, they’re both loud and dirty. While the Honda engine on this model is on the efficient and quiet end of the spectrum, it’s still a big gas engine. The Bostitch is the clear choice for DIYers and light home carpenters/mechanics on a budget. It’s by far the cheapest model here, and it has a surprising amount of power built into a very small and portable package. If you’re using lighter tools like brad nailers, staplers, and smaller impact wrenches, it should serve your needs just fine. It also comes made for multiple users, and is quieter than other pancake compressors On the downside, it’s still pretty loud, and it’s not quite as streamlined or pleasant to use as the Rolair. 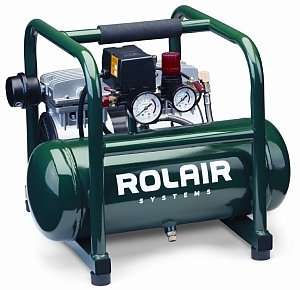 The Rolair is our recommendation to people who want the absolute best portable compressor for lighter jobs. It’s more streamlined than the Bostich, and has a squared-off design which packs easier, balances better, and provides much more protection for the important components. It’s much, much quieter than the Bostitch, and provides nearly as much power. Previous buyers raved about what a joy the Rolair was to use, and it has an excellent record for reliability. It’s equally at home in the workshop or on the worksite. With all that said, it’s on the small end of the portable spectrum, and it’s not a good choice for using larger tools, or for supplying several tools at once. The NorthStar is at the absolute other end of the spectrum, at least where power is concerned. It’s 10X as powerful as the Rolair, and it’s no-brainer for our top quality slot. This thing is rugged and unbeatable in terms of power, efficiency, and air capacity. While we know there’s a big jump in size, power, and price between the Rolair and the NorthStar, we don’t think much of the electric compressors in the middle. They’re all built for light jobs or medium jobs that don’t need continual air feeds. If you’re going industrial, we think you should go all the way and get a 2-stage gas compressor! This is one of the most cost-effective units on the market, and it provides ample power for the largest and most air-intensive tools. While it’s expensive, it’s one of the most affordable 2-stage options. If you’re a working professional who uses air tools, like a farmer or mechanic, or a contractor working off the grid on job sites, there’s really no better power source than the NorthStar. However, it’s big, bulky, and heavy–it’s also cost-prohibitive for most buyers. Portable air compressors are available in a wide price range. With such a wide range of prices and models to choose from, you’ll want to decide which how much you can afford to spend on your new compressor. Think about the price-class of your tools, and choose a compressor at about the same level. If you’ve got premium tools, it would be inappropriate to try to supply them from a budget compressor, and vice versa. You’ll also want to consider how often you use your compressor, and for which applications. If you’ll be using your compressor on a regular basis, you can easily justify spending more up front on your machine. You’ll get your money’s worth fairly quickly, and notice all the differences in quality between the budget options an the premium models. If you don’t use an air compressor regularly, and are getting it as an occasional tool, you may not want to spend as much on your machine. More expensive air compressors are more efficient. They use their air tanks more effectively, since they work at higher PSI levels, packing more air into the same amount of space. You’ll find that more expensive models work efficiently to keep your air tank pressurized with as few running cycles as possible. They have more accurate pressure gauges, which makes using your tools safer and more reliable. They also have better safety features, like overheating protection and thermal overload protections. High-end compressors have rugged, reliable builds. Finally, they’re much quieter. You’ll pay a lot more (sometimes twice as much) for a really quiet compressor, but if you use a compressor for hours at a time on a regular basis, you’ll appreciate that you spent a more for a machine that’s actually pleasant to use. And, of course, power will be the ultimate deciding factor in how much you’ll need to spend on your portable air compressor. More powerful air compressors cost more money, plain and simple. That’s especially true for portable units. Expect to find 0-5 CFM with $100 to $500 units, and look for 5-15 CFM in units from the $500 to $1500 range. , you’ll be looking at mostly dual-stage compressors, all of which will easily supply 15-25+ CFM. If you’re a casual DIYer, or simply looking for an air-powered solution for your home workshop, you probably don’t need to spend a lot on your compressor. We recommend spending at least $150, though, to make sure you’re getting something reliable, from a reputable tools company. If you’re a full-time carpenter, mechanic, or other tradesperson, you’ll probably want to spend more, assuming you need a larger compressor with the power to run larger tools. If you’re a tradesperson who uses mainly smaller air tools, though, you can do very well for the cheaper ones. As we’ve said, the biggest differentiating factor between the cheapest air compressors and the most expensive options is the amount of air power the machine produces. Before you start shopping, you should get a clear idea of how much power you need your machine to provide. We’ve got an in-depth guide to helping you understand how air compressors’ power ratings are calculated, and breakdowns of all the specs, including a step-by-step walkthrough to help you find your power rating on our homepage (here). If you already have a solid understanding of how to determine your power needs, read on! Portable air compressors generally span a power range from about .5 CFM for the smallest units to 25 CFM for the largest. That’s as powerful as a stationary compressor! You’ll want to choose the right amount of power for your tools, and for your work setup. For instance, if you use lots of continuous-feed tools, or work in tandem off the same compressor, you’ll need something a lot more powerful than the average DIYer. More powerful machines come with higher price tags, along with heavier, bulkier designs. If you use mainly lighter tools, you’ll be able to get something smaller, lighter, and less expensive. Lighter tools generally require between .5 and 5 CFM, depending on the tool. We recommend that even the most casual DIYer get a compressor with at least 2 CFM. That’s enough to handle brad nailers, staplers, and smaller impact wrenches handily. Depending on the tank size and working PSI of your compressor, 2-3 CFM may be enough to power two nailers at once, and these smaller units are plenty for most light DIY tasks. Heavier tools like sanders, grinders, and big impact wrenches usually need 5-10 CFM or more. If you’re working with larger industrial tools on a farm, in a shop, or on a worksite, you’ll probably want a portable air compressor with at least 15 CFM. When you’re considering power, be sure to consider the trade-offs between higher capacity/power, and portability. The more powerful your portable compressor is, the more you’ll be able to do with it. However, you’ll sacrifice portability and convenience. Try and find that sweet spot where you have as much power as you need, in a package that you can still carry easily to wherever you need it. Portable air compressors come in both gas and electric models. Before you shop, think about which power source suits your needs. Electric models are quieter, and they can be run indoors as well as outside. They’re the best choice for people who will use their compressor in a workshop as well as on the go. We also like them because they tend to be cleaner and quieter than gas engines, and there’s less maintenance and upkeep to think about. However, they require an electric hookup, and most larger electric compressors can’t be run off generators. Gas powered compressors can provide the most mobile air power for industrial applications and larger tools. They also work absolutely anywhere, since they don’t need an electric supply. We think they’re the best choice for people working primarily outdoors or on worksites, especially if you frequently work in places without a good electrical hookup. However, they’re heavy, and the nature of their combustion engines makes them unsafe to use indoors or in poorly ventilated areas. You’ll also have to do a bit more maintenance and upkeep work on a gas engine, since it’s a messier fuel system to deal with. There are a few different styles of portable air compressor which you’ll see offered by nearly every company. Each brand has its own take on the designs, but the general styles are common. The most frequently-used designs are hot-dog and pancake style compressors. You’ll want to choose the one that makes sense to you. Think about portability, both in terms of weight and size. Think about how big an air tank you prefer, and how much power you need overall. These are all differences between each style. Pancake compressors tend to have a flat, wide, air tank, and a central motor which sits on top of the tank, at the center of the unit. They’re the best choice for when you need the lightest compressor possible, with the best air capacity. They tend to have bigger tanks than hot dog compressors, and they’re generally very light weight. However, they don’t have a lot of protection around the motors, valves, and other components, so they’re a bit less rugged than hot dog compressors. The wide format also makes them a bit awkward to carry by your side, although they’re light. Finally, pancake compressors are some of the loudest power tools on the market. You’ll definitely want to wear ear protection with these. Hot dog compressors are more expensive than pancake models for the same power class, but they have a few key advantages. Their tubular frames provide a lot of protection for the tank and compressor components, and they tend to fit very easily in trucks or on shelves, since they have squared off edges. They also run much, much quieter-sometimes 1/4 the noise level of a pancake compressor of the same power class! With that said, they do weigh a bit more, due to the sturdy metal frames. These machines also tend to have smaller air tanks, so they need to power on to refill the tanks more often. To choose between the two styles, think about your priorities: do you need a more rugged unit, or a lighter, more portable unit? Do you need the biggest power rating for your dollar, or are you looking for something quieter and more refined? Do you have an unrestricted power supply, or do you need a machine you can pre-compress and run from the tank? Answering all these questions will help you narrow down your options. Other styles of portable compressor do exist, but they tend to be found just at the top end of the price spectrum. If you’re spending a lot on your new portable unit, you’ll start to see high-powered gas units which don’t fit either the hot-dog or pancake types. However, once you’re looking over the $1,000 mark, any air compressor is going to be heavy and bulky, and small design differences won’t make much of a difference. You’ll want to look for compatibility with rolling bases, vehicle mounts, or other solutions for dealing with heavier portable models. Just as you’ll need to weigh power with portability, you’ll also want to weigh portability and convenience against durability. Lighter machines are easier to carry, and so are machines with smaller frames. However, heavier-duty machines stand up better to hard-knock use, and larger roll-bar frames protect important components when you’re transporting your compressor, or using it on a hectic or chaotic worksite. Think about how you use your machine primarily. While all portable compressors are probably going to be moved once in awhile, there’s a big difference between a home DIYer who keeps their compressor in one place for 9 out of 10 applications, and a contractor who brings a compressor to every job site. If you’re moving your machine frequently, you should consider buying something more rugged. If you’re planning to keep it mostly in place, and bring it to a small outdoor job now and again, you can probably get away with something lighter and less rugged. If you’re going to need to carry it single-handedly, you should probably keep the weight under 75 pounds. If you plan on buying a very large portable unit, you may want to consider installing it on a dolly, cart, wheeled base, or in the bed of a service vehicle like a van or pickup truck. Otherwise, you’ll need assistance to move your portable compressor around. Large, heavier models are best suited to work crews who can team up to transport them. They’re also great solutions for people who have a truck or van to work out of. If you’re still searching for your ideal air compressor, check out the best-selling models on Amazon!